76, Boulevard de Strasbourg, 75010 Paris, France. 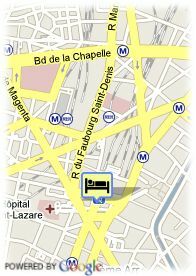 The Amiot Hotel is a 2-star hotel ideally located in Paris since over a century. With attractive rates the hotel offers 68 (single, double, triple and quadruple) rooms, all fully equipped with television (Canal+ & Satellite) and free and unlimited Wi-Fi Internet access. 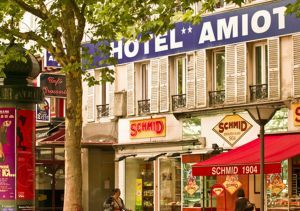 Located just opposite the Gare de l’Est (station), the Hotel Amiot enjoys a strategic situation near the department stores, the Opera, Montmartre and Châtelet Les Halles. Whether you are travelling for leisure or business, the Amiot Hotel will welcome you in a warm atmosphere and will do everything to make your stay as enjoyable as possible. Paid public parking near the hotel (covered) (15.00 €). For older children and adults 20.00 € for each additional bed is charged. Gare de l'Est is a lively area with tens of shops, cafes and restaurants. The location is very convenient for travellers arriving in the Gare du Nord or Gare de l'Est, the two very important railway stations connecting France to the Northern and the Eastern Europe.